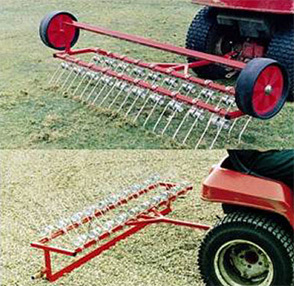 The SCH SR2 Scarifying Rake is designed to remove dead and matted grass from paddocks, pastures and rough grass areas. The rake can also be used for combing through horse maneges and freshening up large gravel drives and car parks. By removing the transport wheels and turning the rake upside down, it becomes a useful tool for levelling seed beds, mole hills etc. The rake is transported in the upside down position on the two wide profile wheels supplied.